Andorra is a tiny, independent principality situated between France and Spain in the Pyrenees mountains. 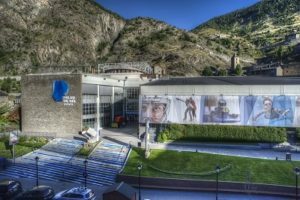 It’s known for its ski resorts and a tax-haven status that encourages duty-free shopping, but Andorra has a little secret that not to many people know about and that is it plays Ice Hockey. We got a change to speak to Aleix Manosas Vice President of Andorra HG the only club in the country. How did you become the Vice President of Andorran Ice Sports Federation? I’ve been named President of the only ice hockey club in Andorra on May 2016. This same year I started to be a part of the Andorra Ice Sport Federation Board. In 2017 there was a Board change and I became the Vice President. What changes do you think you can make for ice hockey that others have not made in the passed? First of all I prepared a Development Plan for Andorra Ice Hockey involving referees, coaching and goalie training on one hand, and female and children hockey development program on the other. Can you provide our viewers a brief history of ice hockey in Andorra? Ice hockey in Andorra has a short history. As usual in all Europe, soccer is the most played sport. In our country, skiing is the national sport and very well practiced, too. 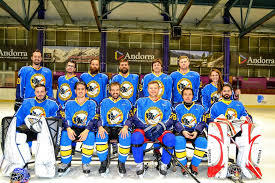 Andorra Hoquei Gel is the only ice hockey club, established in 1989. Since then, all the people who have been involved in the club has worked hard to develop this sport in our little country. We have played a regional league in France and we use to organize and participate in different friendly tournaments. Last year we started with a ladies team and a children teams Under 9. We have a lot of work to do but I’m sure that we are on the good path. Andorra has been an IIHF member since 1995, why has the game taking so long to developed? Ice hockey is a kind of sport that needs a lot of money to be developed. We are lucky to have the government and town hall help in that matter. Anyway, the easiest way to develop the sport is having senior league where child can mirror. Actually we are not there, but I hope that this will not take a lot of years to be done. As I said before, soccer is the most played sport in Andorra. The second one maybe is Basketball because Andorra has a team in the professional Spanish basketball league for the last two years. 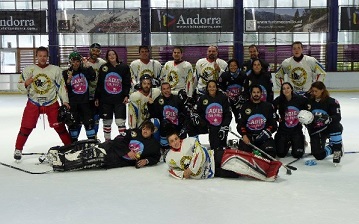 There is only one Ice Hockey club in Andorra (Andorra Hoquei gel). What ice hockey programs does it provide for children and Adults? Yes, there is only a club. Our coach and sportive director is using the Learn to Play program for the children. This helps a lot because all the kids are enjoying a the game a lot and that has been the main subject to achieve our goal of having an under 9 team. In Adults we are playing and organizing several friendly tournaments in the club. The Andorra Hoquei Gel takes part in a senior tournament against clubs from France how has this tournament help the development of hockey in the country? When you are taking part in tournaments like this, it’s is easier to bring new players, adults and children. Every player needs a goal to achieve, no matter your age. This kind of competitions will help us to grow hockey in Andorra. A new tournament will be played In Andorra at the end of the month 2017 Development Cup, why did Andorra get involved? On may 2016 was my first time in the IIHF Congress. There I met people from a lot of different countries and how to learn to develop hockey in Andorra. during a coffee break, I was talking to the Ireland and Morocco delegates. They were talking about creating a new tournament where the little countries who are not available to play in IIHF competitions can play against each other. That conversation was the seed for the Development Cup. During this year we were talking a lot about how to organize a Cup of that kind. For different reasons it was on standby for a while. At the beginning of 2017 we started to talk again. I proposed Andorra as host country for the first Development Cup. I thought that an international tournament would help Andorra to develop this sport. Since then, we are working a lot on the Cup, which is being played on the last weekend of September. This will be the first time that the Andorran National Team plays in a tournament, How will the team be selected and prepare for this event? Yes, for the first time Andorra has an Ice Hockey National Team. Our players have been selected by our National Coach, Oriol Boronat, an Spanish player of the Club Gel Puigcerdà and international player for Spain. We know him and we are sure that his experience is going to be a big helping point for us. When your tenure is over with Andorran Ice Sports Federation what things would like to have accomplished? Once my tenure ends I hope to have accomplished the Children’s National program and have more participation on the following of the Development Cup tournaments and the most important thing: to help more people know that ice hockey is played in Andorra and to make this sport grow in our country. 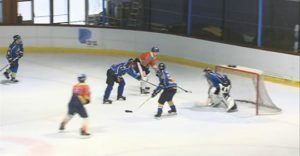 What is the one thing that is unique about playing ice hockey in Andorra? Maybe the landscape surrounding the ice rink is different from other places. Andorra is nestled between mountains and hat makes it peculiar. In addition, we have good facilities and connections to carry out parallel activities. Costa Rica will play in it’s first international ice hockey tournament. The venue will be the Castillo Country Club in San Rafael de Heredia, on 18th and 19th of November. It will consist of 4 teams, three of them from Canada, Los Angeles and the Falkland Islands. The event will be in the Senior category, ie teams will come with experienced players and in many cases with ex professionals on their rosters, which will give a the event a more professional feel to it, and will be the first ice hockey tournament in Central America. “We are celebrating 20 years of ice hockey in Costa Rica, I am the founder and one of the coaches of the program. I started the program in 1996 in the Castillo Country Club, we also played in other places with a synthetic ice, but at Castillo Country Club we are already celebrating two decades. In 2014, the ice surface doubled and our program is enjoying steady growth “said Bruce Callow, one of the organizers. “We have about 40 people in the hockey program, from ages 6 to 40 and 50 years old men and women. Callow said that the tournament is a symbol of the growth of ice hockey in the country. He also said that countries such as Puerto Rico, Mexico and Argentina have asked if they could participate in this tournament when they realized it they signed up for next year’s edition. 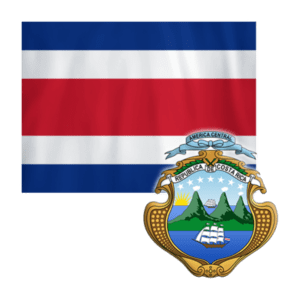 He maintained that thanks to the help of the NHLPA and other organizations and individuals they were able to get donations of equipment to develop the the sport in the country, which is not traditional in Costa Rica, where there is no snow.